Damn that southern ghost! 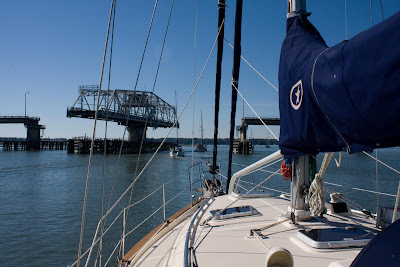 Little wench turned out to be a crap cook, so we tossed her overboard in Alligator Creek, along with most of a loaf of pumpernickel, and beat it toward Beaufort, SC. For the first day in a long time, we were down to one layer of clothes by afternoon, low winds, calm waters, warm air. 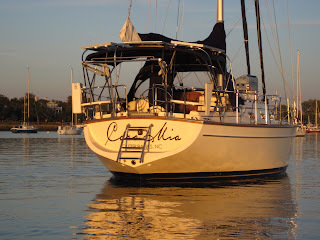 I celebrated with Spa Day on Cara Mia, much needed preparation to attend a wedding this Saturday. When you live on a boat, it's not that easy to just hop off and go to a formal event. Imagine camping for a month, arriving at home and going to a wedding that night. Yeah. That's why I started on Wednesday in a desperate attempt to look presentable on Friday. It was such a gloriously calm and warm passage, there was time for lots of R&R. 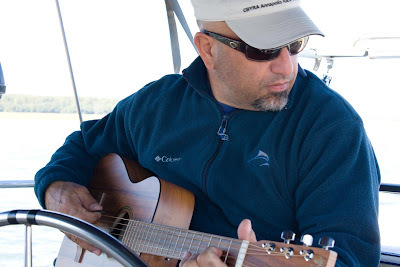 I put the kibosh on Chip multi-tasking at the helm -- at least in the tight ICW -- when he was perfectly on key but terribly off course. Rather than stop the serenade, I took the wheel. I'm not stupid (usually). 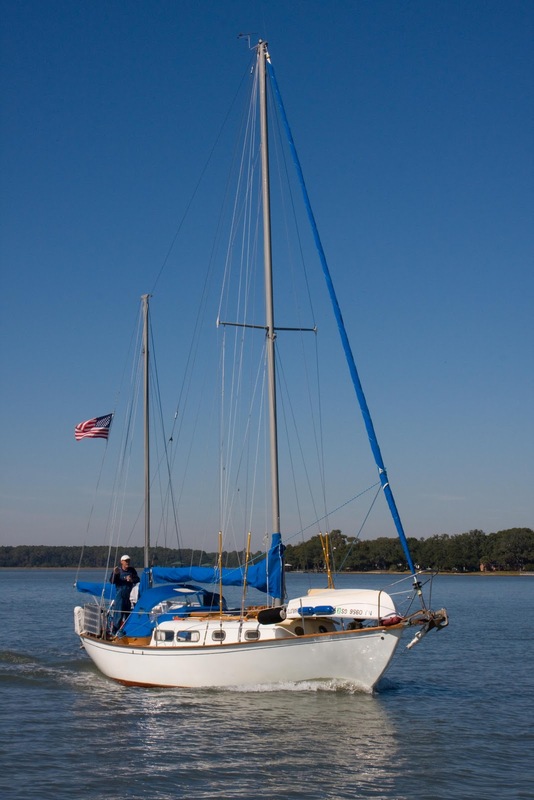 We anchored down just off downtown Beaufort, took a dinghy ride ashore where we had drinks in a postcard. 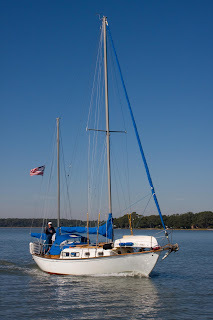 Our dear friends, Marvin and Nancy, took us to dinner where we talked and laughed about cranky windlasses, stubborn oil filters, dinghy davits and reefing. 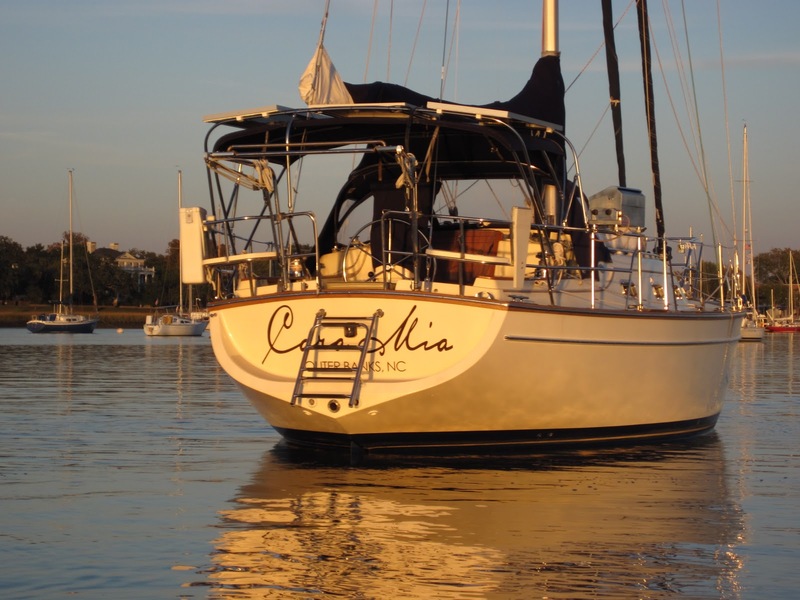 Marvin and Nancy cruised the world on a beautiful boat they loved named Good Company, a beautiful boat that now sails that same world with new owners that love her too, and renamed her Cara Mia. 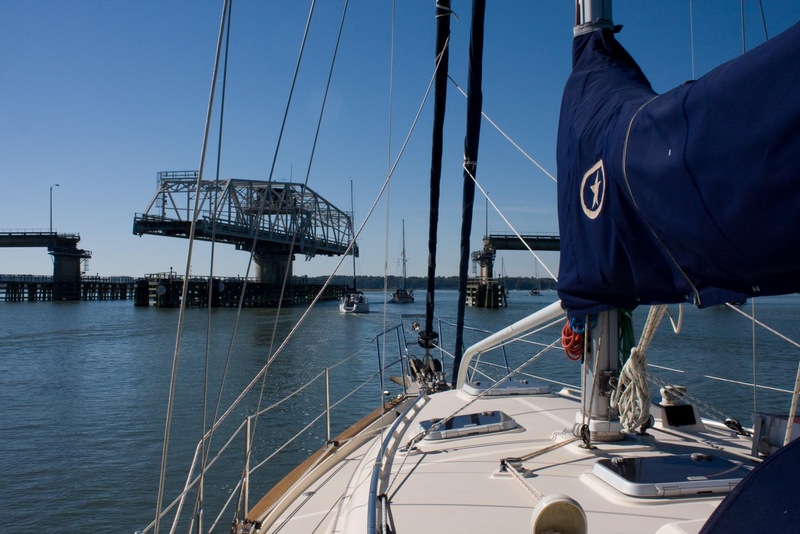 Traffic jam at Lady's Island Swing Bridge. chip, when did u get that guitar? There's nothing quite as cool as your own boat at anchor in a calm anchorage in the morning or evening. I have hundreds of photos of SERENITY in the same light. I can tell you guys can't resist the urge to try and capture that 'feeling' on a photo either!.